Wow! April 22-23rd $75 a night plus fees!!! January and February from $45 a night!!!! UPDATE: Indoor pool access now available. Beautiful, updated resort studio sunsuite at Gulf Shores Plantation. Everything you need for a relaxing get-away. Bottom floor unit with no stairs to climb. Located on the beach side and no roads to cross, and only a short walk to the spectacular sugar-white sands of the Gulf of Mexico, our studio is the perfect place for a couple, a small family, or a small group of friends. 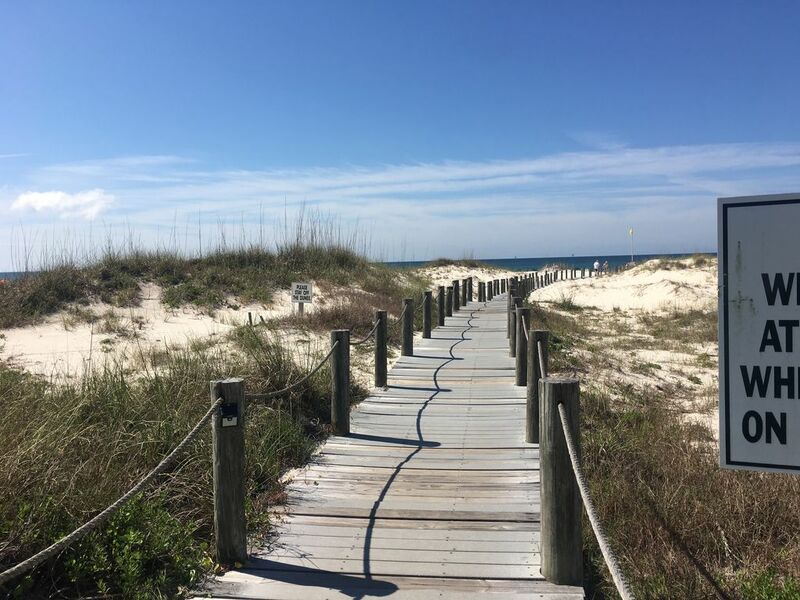 Gulf Shores Plantation offers six outdoor pools, hot tubs throughout the resort, sauna, steam room, exercise room, tennis courts, basketball courts, horse-shoe pits, shuffleboard court, beach volleyball court, and a putting green. Once you get your groceries and supplies, there's really no reason to leave. For the avid golf player, the world-famous Kiva Dunes Golf Course is located within walking distance. Our condo has all of the supplies you need. Brand new mattress and 43” tv. Really, it is a home away from home. Linens and start-up supplies are provided. There is a laundry facility located in the next closest building to our unit. Charcoal grills are located throughout the resort. If you would rather not cook, but do not want to leave the resort, Sassy Bass is located in building 5 of the resort. Gulf Shores Plantation is the perfect vacation spot. It is located away from the crowds, but less than 14 miles from the entertainment in Gulf Shores. Come and enjoy your stay at our resort condo. There is an extra fee for more than one vehicle. We are from Tennessee. We are both school teachers and have always loved going to Gulf Shores Plantation. It was our dream to be able to own a condo in GSP. We love the area and the resort at Gulf Shores Plantation. It was just perfect for us. Linens for queen bed and for queen sofa sleeper. One car parking included in price. $20 each additional car. Good for your entire trip whether it is 1 day or 1 month. Towel set-up for four people. Need to bring your own beach towels. Located in The Dunes building of the complex. Sofa with queen sofa sleeper. Unit has a 27" flat screen TV. DVD player. Newly updated. Stainless steel appliances. First floor/terrace with three stools. Tennis courts located on the left when you enter the complex. Putting green in the resort. Kiva Dunes Golf Course within walking distance. Two pools located in the West complex and four more throughout the rest of complex. This condo is well equipped with everything you need. It is near golf courses, if you are looking for that. Our favorite was Golf Shores Golf Club. Most reasonable and nice course. Also lots of fresh seafood places near by. Enjoyed our stay and will visit again. We had such a lovely time! The place has everything we could have wanted and needed. We loved Sassy Bass, they have the best French Toast EVER!! We will defiantly be back and will stay here again!! No light over dinning area. No light over sink Garbage disposal has very fowl odor. Two "beach" chairs in closet should have been tossed long ago. Not much room for clothes or luggage. It was a real treat for us 74 year olds to get into bed-a few more inches may have helped. With COPD, steps to beach were impossible. Bath lights and stool were a plus. Screen on patio door needs replacing. Bed linens of poor quality. Unit was clean. I do apologize for any inconveniences that you may have had. In the 13 nights that you were there, I would have greatly appreciated you bringing this to my attention, and we could have remedied some of them by contacting our cleaner, such as the light above the sink and the odor from the disposal. Our pictures for our property include a map showing how far it is to the beach. As far as storage for clothing, we have a double door closet, and a dresser. As far as the lighting there is a floor lamp, a lamp on the table, a kitchen light, and microwave light. The chairs were not advertised as part of the amenities. We just leave them there out of courtesy in case others forgot theirs. We were there in January, and there were not any issues with the door. Again, it does help when these things are brought to our attention as soon as possible. No one has brought them to our attention before. Again, I greatly apologize. This was a wonderful place to stay over the holiday week. This part of the resort is low-rise and really nicely staffed and maintained. The neighborhood is pleasant, very few high-rises on the beach, near great hiking at Bon Secour NWR. It was fun to talk to the mix of others staying there. The Seymour's studio has everything that two people need, including a cute little patio that looks on to the pool. A great value. Loved the property and the condo had everything we needed! We will be going back soon. This is one of the best condos I have ever stayed in. My little girl left her baby doll that has deep emotional meaning to her and my family. It was given as a gift to remember my deceased aunt by. We thought we lost her somewhere else or might have misplaced her. The owners reached out to me first, letting us know they would be mailing Abby back to us. This goes above customer service and it’s awesome to know the cleaners did not just trash it. Thanks for a wonderful family vacation!